A deep red mahogany finish doesn’t have to be the result of a complicated process. 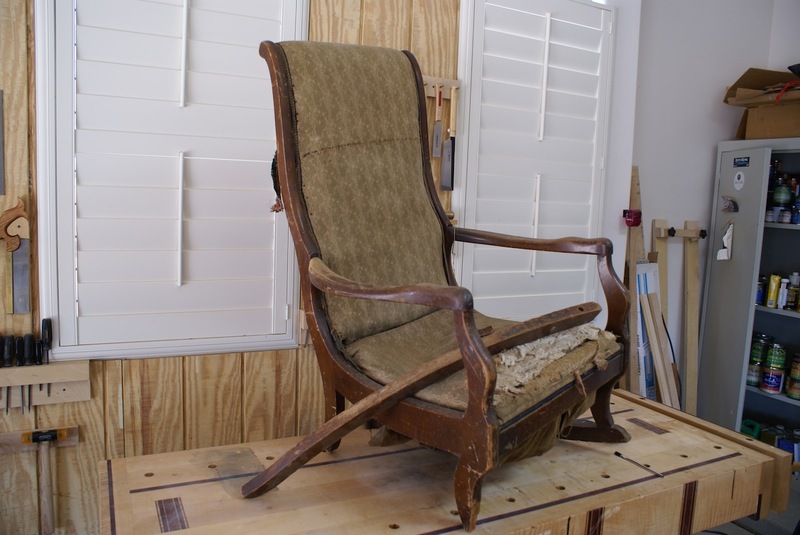 I’ll show you how I use a simple two-step method to revitalize my mother in law’s old beat up rocking char. First, a coat of General Finishes Merlot Water-Based Dye. Second, a coat of General Finishes Brown Mahogany Gel Stain. Its all finished off with a nice satin lacquer topcoat. Add some life to your next project with these easy to use, water based, ultra penetrating stains. Great for achieving clean, consistent color on your projects. Overspray on the lens is bad. You might try rigging up something to hold a sheet of plexy in front of the lens – overspray on plexi, no big deal. Then, if it won’t clean off, you just replace a cheap piece of plexi, rather than an expensive camera lens. Glass would obviously work as well or better, but be fragile & probably more expensive. I was thinking a fan behind the camera blowing over the camera. A box around the camera will foul up the autofocus. Maybe you could wrap the whole camera with this nice plastic from the kitchen used to keep things fresh (in German “Frischhaltefolie”). This will stick to the Cam an could be thrown away after use. Another possibility for protecting it is a SCUBA camera case. They make cheap ones and expensive ones that for diving and surfing. Might be worth “surfing” the web (pun intended) to see the possibilities. How about incasing the camera in a box with both ends open, one for the lens and the other for a fan. Have the fan blow over the camera and an air filter behind the fan to catch any particles. I know this is old but…..I had a chance to listen to the guys from Deadliest Catch at NAB this year. The best protective gear they’ve found for their cameras are ziploc bags and ductape. I must agree with the lens cover. Having done a bit of video work I always use a cheapo uv lens to protect the camera’s optics and a clear plastic bag around the camera. A hole slightly smaller than the size of the lens is cut into the corner of the bag and then squeezed on the lens just enough. Slits, not round holes, are then cut in the bag further back for the hands to get in for operation. Make sure that the slits are below the level of the mounted camera when the bag is hanging loose. seal up the bag opening and you have a nice cheap containment system. I have seen this used and used it myself with no issues of damage to my equipment as long as you are not in a driving rain…then all bets are off, buy the scuba gear! Was that a silk lacquer? I don’t know what that is Mark. camera protection: UV filter over lens glass, and tape plastic bag to shield camera itself from drift. Thanks Marc, that was very helpful. Thank you very much. Yikes — just saw the price tag on the upholstery. End product looks nice, but…. wow. Have you been watching any of the NYW episodes where he tackles the upholstering himself? BTW, what were the big costs — labor or some special fabric? Don’t know for sure Matt. But we called several local upholsterers and they all gave us the same approx. price. The rocking chair requires a suspended set of springs so that all had to be rebuilt. I suspect that’s where a lot of the cost came from. And yes, I do recall Norm doing some upholstery. A little stuffing and some foam I could probably deal with. But with the springs and the little bead detail that goes around the perimeter it was a little beyond me. I watched an episode of NYW not too long ago, on the Lolling Chair. They had two upholsterers flown in that had done a job for NYW on a previous episode. As I watched them work, I was amazed at how detailed the job was and how much skill was required on the part of the upholsterers. Norm tried his hand on a few small portions of the job, but was not really that involved. After seeing that “demonstration” I can see that the $400 mentioned for the cost of the rocking chair upholstery job seems very reasonable. The upholsterers on the NYW didn’t have to deal with rebuilding springs either. Awesome job on the rocker, Marc! It’s great that you were able to salvage and improve upon a family heirloom. Great show. One question, What would be your choice of top coat be if you couldn’t use lacquer. Nicely done! I had never thought about layering finishes like that. You did a great job turning a piece of junk into a really nice piece of furniture. I also would have really liked to have seen how you repaired the rocker. That must have been challenging in itself. The repair was a bit of a challenge. But it was one of those things I just needed to get DONE, so it didn’t even occur to me to bring the camera in the shop. I am sure I’ll have plenty of repairs to do in the future, so I’ll be sure to capture them. Nice job on restoring… Wondering if grain filling was part of the process.. What would you have used? and when? No grain fill on this one, although it wouldn’t be a bad idea. I absolutely grain fill if I am doing a gloss finish. In this case, it was satin and the texture doesn’t look bad at all. If I were going to do a fill, I probably would have come up with a different finish regimen. Perhaps a water-based filler, sanded back, followed by the same staining and top coat procedure. Mixing the dyes wouldn’t work: One was water-based and one was oil. Beyond that, the richness of the effect depends on the layering of different tones. Not to be too technical about it, but any unevenness in the first layer will involve both tone (color) and value (light or dark). Coming back with a different color allows you to even out the value while creating subtle shifts of tone over the whole piece. i.e. Any spots that came out lighter on the first pass will get more of the second color and vice versa. Neat trick and I wonder if this might also be a useful technique for woods prone to blotching. Sorry I missed Jim’s question the first time around, but Rob said it better than I could have. As for blotch-prone woods, the concept of layering color certainly does help in blotch in check. But in this case, I think we still added too much color too soon to prevent it. But using this combination of dyes, the color is so dark that the blotch could have very well been masked somewhat. So we might then get around blotching, but not by preventing it. I guess you’re right. It would work, but no more so than loading up on a single color. So, if you’ve already made the decision to obliterate the grain, this is a more interesting manner of grain obliteration. Nice job… the finish came out deep and rich with a slight red background. You were right it worked perfect with the “mahogany type” darker wood. This project got me thinking that next time I’m at a yard-sale or flea-market ..I’ll keep my eyes open for piece of furniture needing a little TLC. Honestly though I’m shocked about the upholstering price.. The chair turned out great! Thanks for sharing. Upholstery is a significant expense. I talked to an old pro upholsterer last year. He said unless a piece is very high end, it typically isn’t worth redoing. This is because the upholstery job will cost more than buying a new example. Low cost furniture, which is almost everything you see these days, is upholstered overseas where it’s much, much cheaper for the labor. You know, its funny to hear woodworkers comment on how expensive the upholstery is. Upholstery is a craft like any other, right? So if I have the guts to charge $50/hr for my labor, I don’t really consider it crazy to pay $400 for quality work and quality materials. But in the same way that most non-woodworkers have a negative knee jerk reaction to the price of my woodworking, woodworkers themselves can be put off by the price of someone’s upholstery work. I guess we are all guilty of being cheap b****ards, haha. Perhaps you misunderstood me. I wasn’t complaining, Marc. I was pointing out that, according to a professional, it’s probably not worth reupholstering a low end piece of furniture. I thought it might help our fellow woodworkers who might be considering reupholstery. I don’t think it’s crazy to spend $400 on upholstery. 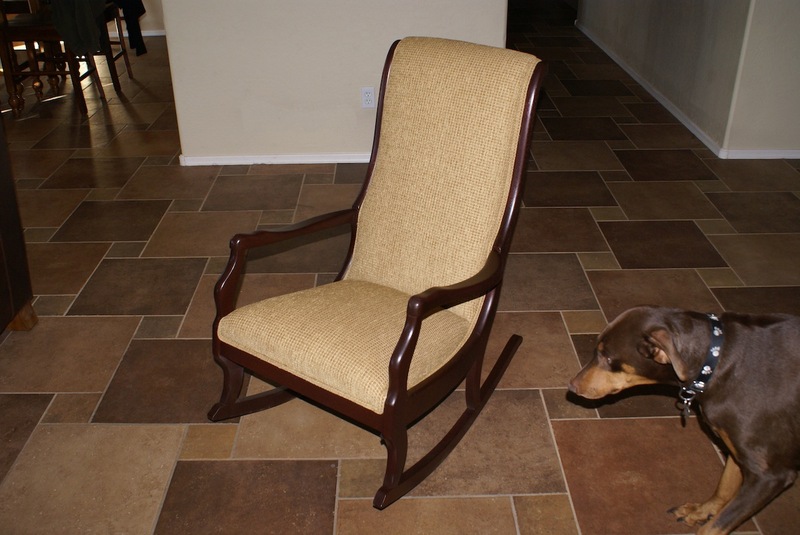 That was a nice, hardwood chair you refinished. Obviously, it makes sense to finish it right. I didn’t mean to suggest it wasn’t worthwhile. Sorry if it sounded that way. No I completely understood what you were saying and I agree. I probably shouldn’t have used your comment as a reply point since I was making a more general comment to everyone. I’m going to be repairing and refinishing a piece of furniture for my own Mother in law soon, too. It’s going to be fairly straiht forward though, because the repairs only involve making new doors to replace the veneered particle board doors and then refinishing the whole thing. I think getting the old finish off will be the hardest part. I would love to have seen how you repaired this chair though! First off, the whole point of getting into inlays, marquetry or segmented turnings is working with the natural palette of wood colors. This is how people develop a very expensive sweet tooth for exotics or bizarre stuff like the “Polynesian vegetable ivory nuts” that Marks was working with in the shop tour video. Presumably, you wouldn’t be running pigment over such work in the first place. But, perhaps a little chemical witchcraft would help to amp the contrast between already different species. Mahogany, for instance, goes quite dark with a solution of Potassium dichromate. If your inlay is a light colored species that doesn’t react with K2Cr2O7, then rock on. Ammonia vapors and tannin-rich woods are another trick. All that presumes, of course, that you’re starting from scratch and can pick your species. For an older piece of mystery meat wood such as this chair, you’re SOL. Yikes, $400 for upholstery. That’s the sort of kick in the teeth that makes one wonder if we’re in the wrong part of the business. As for keeping sprayed finish off the lens, why not just move the camera way back and zoom in? As a bonus, that’d also narrow the field of view and give you fewer distractions (i.e. neighbors’ houses) in the background. If you were to do the same thing on poplar however didn’t want to mask the grain how would you try to go about getting a dark color without masking the grain? Would you pretreat the wood still to limit the blotching like you show in other in your staining video? Well, poplar has a real big problem in addition to its blotchiness: its green! So you have to take steps to shift the color over to brown and red, which can be quite a challenge. This isn’t really something I’ve done before so I can’t throw out a good recommendation. But I would probably start playing with dyes and a lot of scrap wood. Maybe try some light coats of a reddish dye to try to cancel out the green. Once you have a good base, then you can take the color in whatever direction you want. But by the time you cancel out or overcoat the green, you might have already lost a significant amount of grain clarity. So lets just say poplar isn’t the best choice for a stained project….. But with a lot of testing, I do have confidence that you can get a decent result, but I suspect you will lose clarity. I know this is an old thread, but I thought I’d add something about staining poplar. Because poplar is often varying degrees of green, rather than using a red dye, you would want to use the nearest tertiary neighbor, which would be orange. Orange and green will give you a warm, muddy brown. Once you’ve gotten to the brown (which will be about a medium to medium-light brown), you should be able to then overlay the reds (or traditional browns + reds). The problem with attempting to cancel out the green with red is that your end result will still be “red” – and will not posses the tonal quality this video covers. But, as Marc also points out, you do stand to lose quite a bit of grain if the poplar you have is not particularly figured or is so green you have to go heavy. The solution for the camera lens is quite easy. First – buy a BIG barbeque pit. Second – buy a LOT of meat. Third – invite everyone over to your house to watch you spray and while it’s curing, we can all eat. Your camera is never in harms way and everyone gets to learn more. Problem solved. Yes, payment by check is acceptable and I like my steak ‘medium’. Seriously though, you did a great job at bringing that back to life. You must be very proud of the end result. Great restore. I loved the layering technique. I’ll have to give it a try. Thanks Marc, I really appreciated this video. I recently started a new project, building a bedroom set for my wife. I’m starting with the bed. It’s a platform bed with drawers for storage underneath. Building the bed is the relatively easy part. The hard part was that she wanted the color to match a fairly horrible 2 drawer office style cabinet that she picked up from a garage sale. It’s one of the particle board type things with a deep red mahogany color. I’ve been trying different combinations of stains (mainly gels) trying to match the color but the closest I could get was more of a brown and very splotchy as any type of sealer I applied would leave the wood far too lite in color. The finish you ended up with is pretty much spot on the color that she wants the furniture to be. You’ve saved me probably at least another $75 – $100 in test stains and dyes. Again, thanks for the info in this and all your videos and blogs. I have to say, I’ve learned more from watching your videos (and having a laugh or two along the way) than I have from any other source, including the years of trial and error. ;) Thanks! Very good video Marc. I’ve tried so many finish applications, and your low entertainment center wipe-on finish sold me, and has done me well. I’ve always had trouble with overspray on furniture and am anxious to try diluting the finish even more for the last coat. Also, you may try using a glass front (about a 1’x 1′ for the camera) then tape it directly to a basic paint tent around the back of the camera. Just build a basic box frame and mount the glass to it. Every time you decide to film a spray-up, when the finish dries,just scrape the overspray off with a straight blade. Good luck, thank you, and keep it up. Hiya Marc! I have been soaking in tons of your videos and they are all great, my wife even enjoys sitting and watching with me. You mentioned finishing your projects outside in the driveway, do you have any problems getting dust/debris in the finish that way? If so, what steps do you take to remedy them? I’ve had some bad experiences with finishing and am a little finish-shy, as a matter of fact a lot of the projects I’ve built for folks have stayed raw and they finish them. I just finished two twin book cases for a friend/client and used the one step polyshades stuff from minwax and hated it, it was blotchy and uneven and hard to work with although she was happy with it, I’d like it to be better. The second one will get finished using one coat of BLO and two coats of water based Poly, a WOOD magazine project was finished in that manner and looked pretty simple so I’m giving it a go. Anyway, thanks for reading, my questions was about spraying outside, I’ve been considering buying a sprayer but was concerned about where I would spray so your technique intrigued me. I usually suggest that people try to “master” one finish before trying a bunch of different ones. The only way to get good at applying it is to apply it many times, either in practice or one real pieces. And the one finish I think has the lowest barrier to entry is a wiping varnish. Its also versatile and quite durable. So frankly, that is where I would start if I were you. I can honestly tell you that venturing into the world of water-based finishes, at this stage, is definitely NOT going to make your life any easier. Water-based finishes can be finicky and they don’t give you a lot of working time. I hate to push my DVD like this but that’s exactly why I made it. Its called A Simple Varnish finish and it really does a good job of dissecting this seemingly simple process. If you don’t want to buy the DVD, you can find a lot of the tips scattered throughout the site in various articles and videos. Now once you get a good wiping varnish finish under your belt, then I would venture off into other things like the water based finishes, lacquers, and shellac. It does help, thank you. You’ve given great advice so far so I took it again and bought the DVD, anxiously awaiting it’s arrival in 2-5 days :). Thanks again! Just discovered your site this weekend and love it. Hopefully you’ll respond to a comment on an older video. When layering colors, would layering different dye stains have the same effect or was the combination of dye stain and gel stain the trick? I’ve also seen some stuff about layering a dye over a milk paint base. Thoughts? Hey Jack. Layering coats of dye will not give the same effect. Gel stain tends to mask grain somewhat and is a lot like spreading a loose paint. So the dye gives the wood an initial tint and the gel stain comes back and layers a final color on the surface while masking much of the grain. You could probably get the same color with dyes alone, but it won’t look exactly the same. Not better or worse, just different. And as for milk paint, I don’t really use it all that much. My guess is the dye simply stains the milk paint. I’d imagine you can get some cool effects that way but that definitely falls into the world of painting as opposed to staining. what was the name of the blues song you used as background music.